Searching for Kawai CE220 Digital Piano? You are on the right page, in this Kawai CE220 review; we are going to look at is specs, features and what makes it tick compared to other digital pianos. Kawai CE220 comes with some of the finest features on the market. 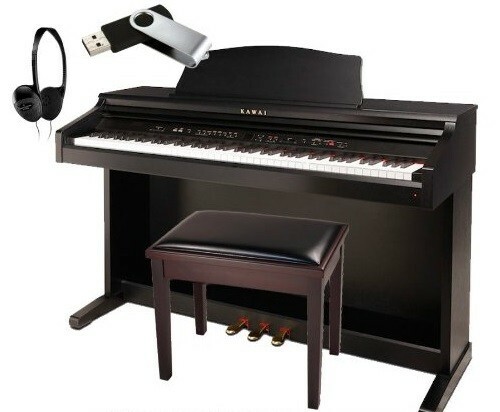 It features the famous wooden-key action as well as offering the finest touch available in a digital piano. The CE220 is a great choice for those looking for a high-quality digital piano as it features 88-key piano sampling, 192 notes of polyphony, wooden keys, furniture-style construction, responsively realistic pedals and easy to use digital piano. CE220 features Kawai’s award-winning AWA PROII keyboard action. It utilizes the long wooden keys to recreate both the weight and movement of the grand piano actions. AWA PROII action does an amazing function as it delivers an authentic piano feel that will satisfy even the most discerning pianist. CE220 keys are wooden which is not found on most digital pianos. This gives you a realistic key action you need. It also enables you to press the right keys to produce the correct information you need. CE220 key action is weighted and graded. CE 220 offers MIDI jacks and a USB jack that are useful for connecting with other musical instruments and computers. The Line In jacks allows an external audio device to be connected so that it can be heard through the instrument’s speaker system. The Line Out jacks allows you to play through an external sound system.